NOTE: This feature is only available for accounts on the Professional plan. If you would like to upgrade your plan, talk to your Grow account manager or visit your account's billing page. Please note that filtering is only enabled for a single report. If you have multiple reports that you want to filter on, first join them into a master report. Filtering will then be available on the master report. To enable Filter and Drill for a specific metric, click “Edit Metric” and expand the “Filterable Columns” section. Choose the columns that you would like to make available for a person to filter in the metric’s Expanded View. NOTE: The columns that you select in the “Filterable Columns” section will be the only available columns in the Drill Table. So if you want to see more columns when drilling, select more columns under this header. To use filtering in Expanded View, expand the metric from your dashboard, then click the column you’d like to apply filters on. You can then select the operator you’d like to use and enter the values to filter. If that column is a date column, you can check the "Treat as Date" checkbox before choosing the operator and filter value. For date columns: The “Exactly," "Before," or "After” operators allow you to define custom dates you’d like to filter. For non-date columns: The operators “Equals” or “Does Not Equal” allow you to select multiple values from a list. Any other operator will require you to manually enter a value. To drill into the data, click a data point on the metric when it is in Expanded View. This will show you more detail about the data point you selected. The drilled data view will account for any filters that you applied in Expanded View. You are as filterable or drillable as the things you give your metric. The more you give Grow to filter, the more you’ll be able to filter. If you have used a pivot table. When using a calculated column or pivot table, you will be able to filter those columns that exist at or after you applied those two transforms. For all other transforms, you will be able to filter back to the last "checkpoint"—either the original data you pulled from the API or a pivot table or calculated column. When you get into Edit Metric, if there is a certain field you want to be able to filter on, make sure that box is checked under the Filterable Columns heading. The nice thing about filtering is that even if the metric on your dashboard doesn’t show certain fields, you’ll be able to filter on them if they’ve been selected. While drilling into your data only gives some actionable insight, it does allow you to ask questions about what is happening. Those questions will then lead into greater insights to your company. For example, let’s say you are looking at your company’s sales and you notice it spiked one day. Drilling would let you look into it and figure out why they spiked. You can find the value of the sales closed that day, the sales rep that closed them, among other useful information. With both filtering and drilling, if you want to be able to filter off a certain field, make sure it is part of the report that builds up your final metric. Drilling is based on the order of operations above and then whatever filters you apply in Expanded Mode. If you just expand the metric, don’t apply any filters, then drill into a data point, you will see all of the data for that specific point. It levels the playing field in your business. 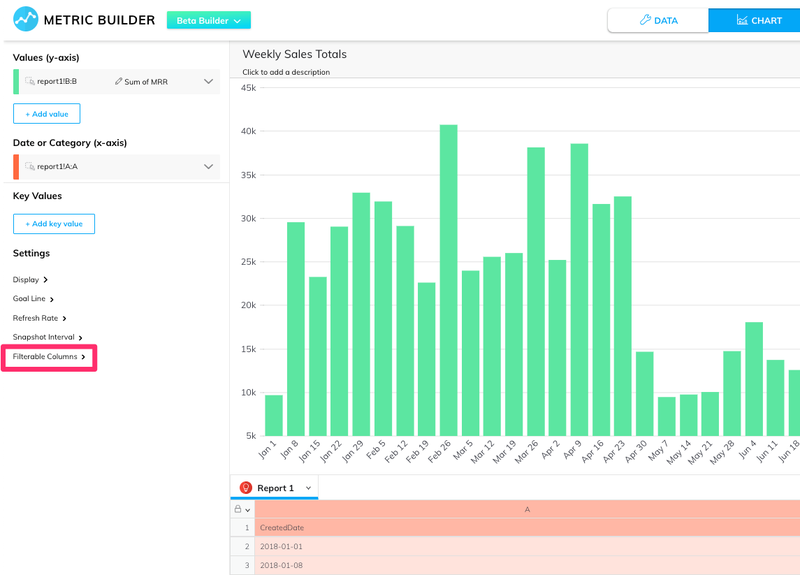 The numbers for some reps or sales or other metrics may look large, but filtering and drilling will allow you insights into what is actually happening. You don’t have to pack a whole lot of data into one metric. Just make sure it is filterable, and even if it’s not displayed on the metric, you will still be able to see what’s happening. You will get to the core a lot faster. Before filter and drill, you may have had to build out many metrics in order to see things you needed to see. Now, with a couple clicks of the mouse, you can quickly answer the questions that you have. It empowers even a very basic-level user to answer a lot of questions about the data. It is easy to see, to understand, and then to talk about the score with your company.